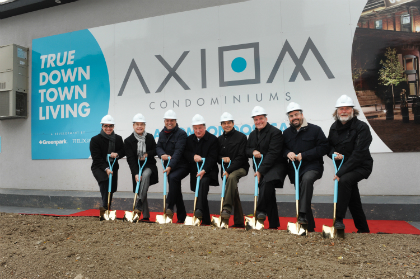 We recently celebrated the official ground breaking at AXIOM, digging into the dirt with our golden shovels. While we commemorated the milestone, the demolition crew was on site, taking down a brick building to completely ready the land for excavation. 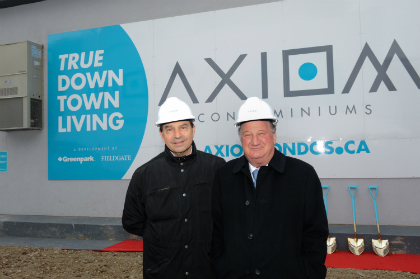 AXIOM is a two-tower condo development, so the parking garages for both towers will be dug at the same time, and then Phase 1 will be the first tower to rise. Thanks to the prime location at Adelaide and Ontario in Toronto’s blossoming east side, registrations have been flying in quickly. It comes to no surprise since the condo is within walking distance of amazing Toronto neighbourhoods like the St. Lawrence Market, Distillery District, and Financial District. 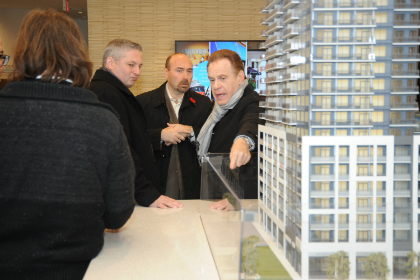 At AXIOM Condos, the suites range from studios to two-bedrooms plus dens, with the largest penthouse suites reaching nearly 1,000 square feet. A few of the high quality appointments include contemporary custom designed cabinetry, quartz countertops, porcelain tile, and lock system prefinished engineered natural oak flooring. AXIOM 2 is 70% sold and there are many fantastic suites still available! 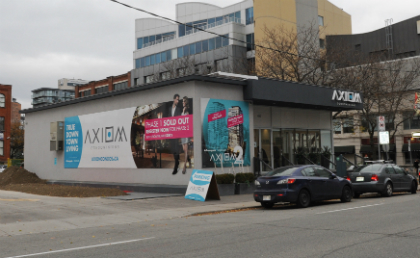 The sales office is temporarily closed, so visit axiomcondos.ca or call 647-352-4077 to receive more information.